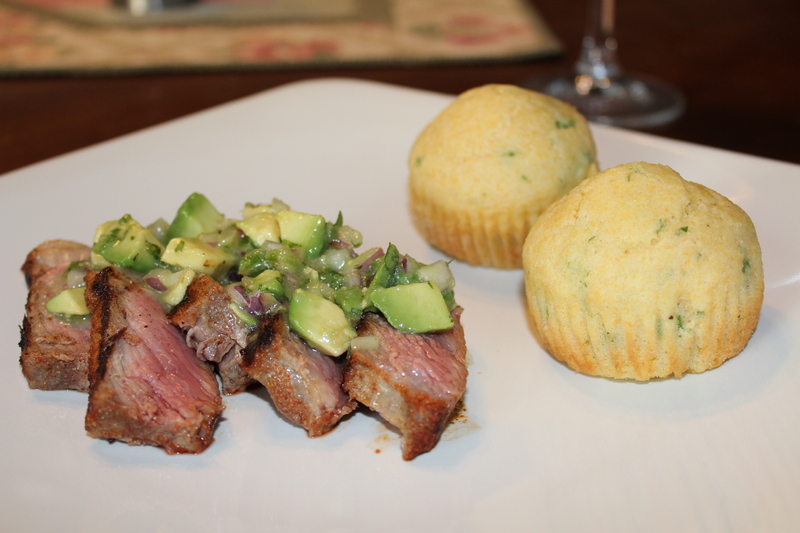 Tonight I wanted something quick and easy to cook… I landed on spice-rubbed New York strip with avocado-lime salsa and herbed corn muffins. This was actually pretty easy (took about an hour total) and came out really well. I found this recipe in a magazine (along with the recommendation for herbed corn muffins) and thought it sounded light and summary. It was really delicious – a nice blend of spicy and cool (thanks to the avocados!). Preheat a grill or grill pan to high heat. Place first 6 ingredients in a bowl; gently stir in 1/4 teaspoon salt and set aside. Combine remaining 1/4 teaspoon salt, cumin, and the next 4 ingredients (through cinnamon) in a bowl; rub spice mixture over both sides of steaks. Cooks steaks for 3 minutes per side (I did a little longer to make them medium). Let stand 5 minutes and cut across the grain into thin slices. Serve with salsa. Combine buttermilk, olive oil and egg. Stir well with a whisk. In a separate bowl, combine flour, cornmeal, sugar, baking powder, baking soda, salt, and pepper. Make a well in the center of the mixture and add the milk mixture, stirring until just moist. Stir in green onions, parsley and thyme. Spoon into 12 muffin cups coated with cooking spray. Bake at 400 degrees for 13 minutes or until a wooden pick inserted in center comes out with moist crumbs clinging.